To American Indians, a beating drum is far more than a means to make music or create rhythm. It symbolizes the human heartbeat and connects one generation to the next across time. On Friday night, Oct. 10, traditional Indian drums will beat in Denver, as American Indians and their supporters march by candlelight from four compass points across the city and converge at Cuernavaca Park, where the Cheyenne and Arapaho once camped. 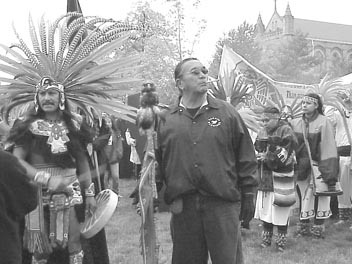 The gathering marks the third annual Four Directions All Nations March, which began in 2001 as a new approach to Denvers Columbus Day conflict after years of protests and mass arrests, which continue to this day. But in the past three years, the march has become more than the celebration of diversity and unity its organizers had envisioned. An event that draws thousands to the streets of Denver each October, the march has given rise to other events and a multi-cultural activism that stands on the vanguard of community building and race relations in Colorado and the United States. Joining this years march are Rigoberta Menchu, winner of the 1992 Nobel Peace Prize, as well as Kathleen Cleaver, a former Black Panther, and Fred Hampton Jr., son of Fred Hampton Sr.a Black Panther who was murderedand an activist in his own right. Columbine survivor Richard Castaldo, an Italian American, will also join the march. Drawing on the symbolism of the Medicine Wheel and the spiritual significance of the Four Directions in American Indian spirituality, the Four Directions March is a ceremony intended to bring all people together to celebrate peace and diversity and to prepare for a future that does not involve violence, racism and oppression. "What were hoping to show Denver is a strong, visible image that people of all colors can come together to solve the problems and issues that we haveif we make that choice," says Gail Bundy, a spokeswoman for the Red Earth Womens Alliance, one of the groups sponsoring the march. The celebration of Columbus Day began in Colorado, and if a coalition of local activist groups have their way, the controversial holiday will meet its end here. First observed in Colorado in 1905, Columbus Day honors the memory of Italian explorer Christopher Columbus, who, in 1492, came ashore in the Caribbean and claimed the already-populated land for Spain. Erroneously credited with "discovering" the AmericasVikings beat him to it by several centuriesColumbus is still honored by many for his alleged bravery and skill as a navigator. But American Indians have long seen Columbus in a different light, remembering him for his enslavement and murder of Indigenous peoples, as documented by his contemporaries. Bartolome de Las Casas, an eyewitness, estimated that some 5 million Indians died in the first three years of Columbus governorship. De Las Casas recorded in excruciating detail the violent treatment of Indian people that occured under Columbus, including the murder and dismemberment of children, and decried the violence in letters he wrote to Spain. Given Columbus brutality, American Indians and their supporters say Columbus Day is nothing more than a celebration of colonialism and genocide and insist they wont rest until the holiday is removed from the calendar. Local activists have been protesting Denvers parade since 1988, when the American Indian Movement of Colorado (AIM) announced a four-year campaign to educate the public as to why Columbus Day is harmful to American Indians. Protests continued through 1992, when thousands gathered in the streets of Denver, effectively forcing a halt to that years parade. There were no Columbus Day parades in Denver from 1992 until 2000, when a group calling itself Sons of ItalyNew Generation revived the event. The Justice Department intervened and attempted to negotiate a compromise between Sons of Italy and Indigenous groups, under which the name of the parade would be changed to the March for Italian Pride. But Sons of Italy reneged on that agreement, resulting in anti-Columbus protests and mass arrests. The first to be arrested in that year of renewed protests were women, who sat in the street to block the parade. "We wanted to do something active, and we were worried the men would get in a struggle and somebody would get hurt," says TroyLynn Star Yellow Wood. "We wanted to demonstrate a strength and a courage with the women that we hoped would change an attitude of the people that were having the parade, but they just threw us out of the way and went on with the parade anyway." While Columbus supporters shouted racist epithets and jeered, the women were arrested and taken one by one to a waiting bus. The womens decision to sit in the street and be arrested together might not have halted the parade, but it did lead to the creation of a new womens groupthe Red Earth Womens Alliance. The group was intended to give women a safe place to express their points of view and be heard on important issues. When the group met the following spring, there was a strong consensus that women wanted to address the issue of racism in a new and different way. "There was just the sense of the women in the room that we needed to develop something that would be a model for people to look at," says Bundy. What they wanted was a true alternative to the Columbus Day parade, something that would be inclusive, honoring all cultures and races. The concept behind the Four Directions All Nations March was born. 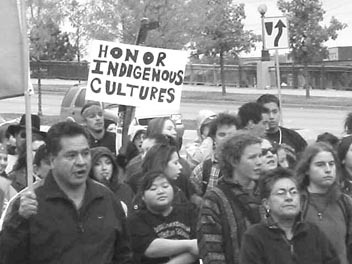 A Four Directions March is an American Indian healing ceremony, in which marchers converge at a central location from the north, south, east and west. The ceremony typically involves drumming, singing and prayer. The Four Directions are sacred to most Indigenous cultures and a part of American Indian ceremonies. Each is traditionally associated with a colorred (north), yellow (east), white (south) and black (west)believed to symbolize the four races of humankind. Four Directions marches have been held as healing ceremonies at places such as Wounded Knee, site of the 1890 massacre at the hands of U.S. cavalry that left more than 300 Lakota dead. The first Denver march was held in 2001 and was attended by more than 2,000 people. The second march likewise drew thousands. Both marches converged at the State Capitol. But this years march will be different. Turning their backs on the Capitol, marchers will converge at Cuernavaca Park, site of an old Cheyenne and Arapaho encampment on the Platte River. To the average Coloradan, the State Capitol is a sight to be revered, its gold dome rising above the surrounding buildings, its white marble and neoclassical architecture evocative not only of the Capitol in Washington, D.C., but of ancient Roman and Greek temples and government buildings. But American Indians see the State Capitol through different eyes. Its gold dome is a reminder of the numerous gold rushes that inevitably resulted in loss of Indian lives and landsincluding the Black Hills of South Dakotato whites hoping to strike it rich. Marble, too, is a reminder of riches taken from the landa problem many Indian nations face today with coal, uranium, gas and oil. The building itself is little more than a monument to a government that has abused, neglected and even sought to destroy American Indians, as represented in a nearby statue honoring Col. John Chivington, who led the infamous Sand Creek Massacre, in which about 200 Cheyenne and Arapahoe were killed while camping under a flag of truce. "We have had this big protest there every year, and nothing changes," says Yellow Wood, whose idea it was to change the center point of the march. "The statute of Col. Chivington and the Colorado volunteers is still there. And so I thought its sort of like a slap in the face. We need to just get away from the Capitol altogetherwhat it symbolizes and the fact that it continues to overlook indigenous people and their needs. Lets turn our back on all of that and take a different stance." Yellow Wood says there were other motivations as well, including a desire to hold the Four Directions march on a separate day from the parade and protests. "It just left a bad taste with everybody because we were trying to have a spiritual march in the morning, and then in the afternoon everybody would be incited and angry and upset about what was going on," she says. "So we had decided after last year that we just werent going to go there and we werent going to do that. Yellow Wood says she prayed about the march in ceremony, and it came to her that the march could be held in the evening and could be brought closer to the land. "The whole purpose is to reconnect ourselves, and to become grounded we need to have our feet on the ground," she says. "All there is around us is cement. Its like trying to connect with cement between us. And so I thought if we could march to a place where there is mostly grass and earth beneath us then we could sit on that and connect in a different way, and we could use those drums as a way of connecting our heartbeat with the earth." Glenn Morris, a member of the Leadership Council of the American Indian Movement of Colorado, says this years march will bring people together in such a way that the Four Elementswater, fire, air and earthwill be a part of the march. "Were going to meet on the earth as opposed to some government edifice that in the past has been a source of oppression for Indigenous people and others," he says. "Well take it to the earth, let the people meet on the earth." Amber Rose Belindo, a student at the University of Colorado in Denver and president of UCDs American Indian Science and Engineering Society (AISES), has participated in the Four Directions All Nations March each year and finds the event inspiring. "I think the Four Directions March is the alternative to Columbus Day, because what were trying to do is have a day where everyone can march together in peace and celebrate their own cultures and their own heroes," she says. "But its not the way to do it through Columbus." Belindo cannot fathom why anyone would still admire Columbus. "I feel theres a whole lot of ignorance in the mainstream, to be quite honest," Belindo says. "People always look at it as minorities trying to complain about something. Instead of thinking morallyinstead of thinking this is not right to celebrate Columbusthey instead think its a bunch of Indians who want to fight about something." Belindo believes Columbus Day still exists because far too many Americans still havent gotten a full story about him or his actions. She places the blame for this on the way history is taught in U.S. schools. "Its taught from the colonial perspective," she says. "Its not true history that has been taught. Its one-sided history." While many American school children are still taught to revere Columbus, they are also raised to believe the arrival of Europeans in the Americas was ultimately a good thing for Indian people, Belindo says. "They still have this concept that Indians were uncivilized and that Indians needed to be civilized, and they agree with that," Belindo says. Belindo and members of AISES have organized their own event in conjunction with this years marcha Take Back History march, to be held Saturday, Oct. 12, prior to the Columbus Day parade and protests. "My hope for it is that we can open eyes," she says. After the success of the first Four Directions March, the groups and individuals involved did not want to quit working together. Many had been involved in the 2000 protests and the Transform Columbus Day movement that was launched when Sons of Italy sought to renew Denvers Columbus Day parade. "The All Nations Alliance really evolved out of that march," Bundy says. "It took its name from the march." The purpose of the All Nations Alliance (ANA) is to move beyond combating the racism of Columbus Day to oppose racism and oppression in all its forms. Made up of about 100 organizations, ranging from the American Friends Service Committee to AIM to the Colorado Anti-Violence Program to Escuela Tlatelolco, members of the ANA set out to create a true multi-racial organization that works for the betterment of all and respects the different cultures and voices of its members. Members say the group is unique in that women have a strong voice and Indigenous people often take a leadership role. "Everybody has differences of opinion," says Yellow Wood. "These are the most opinionated people, and they give a real strong voice to their opinions, so sometimes things can get crazy. But we have an understanding that were all here for the same reason, and so everybody has the right to have the opinions they choose." ANA supports the Four Directions march, but also speaks clearly about the things its members oppose beyond Columbus Day. The organization has spoken out on issues as diverse as police accountability and the spy files to the war in Iraq and the USA PATRIOT Act. Though not a plaintiff in the spy files case, ANA played a pivotal role during the crisis, demanding not just the truth but changes to the system. In the case, the Denver police admitted they had kept covert files on peaceful activists. "From my perspective, it took an Indigenous perspective to look at the spy files issue in a different way," Bundy says. "What they asked for was not punitive damages but restorative justicefor the city to fix its system." Morris says the ANA is trying to make Denver a model of how change can occur in a community but says he was surprised by the way the organization quickly expanded and played a leading role with regard to so many important issues. "I didnt expect it to happen, but personally Ive been very gratified that it has happened," he says. "Its a testament to what is possible when a diverse group of people comes together in a mutually respectful way. I think the emergence of the All Nations Alliance out of this transformative energy is transforming and energizing people on other issues." Its also energizing people in other states. Several cities will host multi-racial anti-Columbus activities this weekend, including New York, San Juan Capistrano, Calif., and Blaine, Wash.
José Garcia, who is helping to organize events in Blaine, says that though Denver is not the sole catalyst for other events across the country, the success of the Four Directions All Nations March has inspired others to become more involved in confronting racism. But Morris makes it clear that the spiritual approach of the Four Directions All Nations March and the broader focus of the All Nations Alliance will not distract activists from opposing Columbus Day. "The Four Directions All Nations March is really about our aspirations, what were for," Morris says. "Weve made it clear since we started in 1988 that if those forces that want to celebrate conquest, colonialism and the oppression of other peoples persist (with the Columbus Day parade), there is going to be visible, public opposition." Morris says members are prepared this year to confront Saturday afternoons parade with everything from a vigil to civil disobedience. 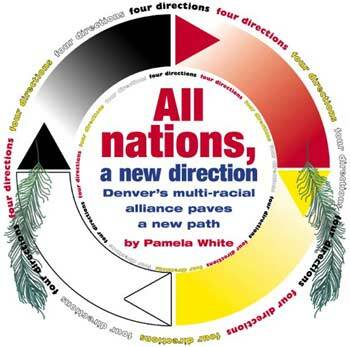 But before any confrontation can occur, ANA members will join together for the Four Directions All Nations March. Everyone is invited to attend. "This country, this nation is just crying for solutions to do things differently," Bundy says. Members of the ANA are trying to provide one alternative, tackling issues one by one. Says Yellow Wood: "Were trying to make changes for indigenous people. Were trying to make changes for all of mankind, for all human beings." North (red) Globeville Landing Park, 38th St. and Atkins Court. Platte and 20th streets, at approximately 7:15 p.m.
For more information on the Four Directions All Nations March, go to www.transformcolumbusday.org. the Auraria Campus in Denver.